34 • RV PRO • September 2018 rv-pro.com R V M A N U F A C T U R E R S "What makes this unique is that it will feature two north- south beds. It's the first time R-Pod has featured any north-south beds," Schade says. "Other notable features in the new 10th anniversary edition would be the round, deep baled-kitchen sink, upgraded kitchen faucet, stainless-steel appliances and other new interior upgrades." Instead of traditional wood, products will feature Azdel composite construction to focus on even lighter towing weights. Schade says the upgrades and improvements to this year's lineup are a direct result of feedback from the 10,000-plus R-Pod owners' member group as well as its dealer network. Meanwhile, No-Boundaries was introduced at last year's Open House. Schade says the plan is to continue with the look unveiled last year while offering a number of new features and at least one new floorplan. No-Boundaries also will be introducing the No-Bo Nest: An exclusive feature offered on certain floorplans that Schade says will not only double sleeping space, but will not add significant weight or size to the unit. The new 16.8 floorplan weighs less than 3,500 pounds and has a single axle. It offers a queen-size bed and an oversized dry bathroom. "Typically, a unit this size would not have a dry bath; it would have wet, which means the toilet is in the shower," Schade says. "We've also increased the ground clearance and created an option for a Rhino Rack storage system to be integrated into the roof." Cedar Creek The Cedar Creek product line has received a complete make- over this year. "We're featuring bigger countertops, all-new wood, new flooring, new carpet, new wallboard. It's a complete makeover of our products and we're excited about where we're going. We've had great reception from retail customers and dealers that have viewed our product. We started shipping new product July 16," says Craig Clair, general manager of Cedar Creek. The Silverback Edition has a new 31IK floorplan featuring a rear living room and slide-out kitchen with a 77-inch coun- tertop with chef 's kitchen. It will have a new residential design that contrasts colors to tie together. There will be outside deeper storage up front and true gel-coat exteriors. In the Hathaway line, there are two new floorplans. The 31IK also features a large kitchen and double lavatories in all Hathaway models. Clair says the bathrooms are 40 percent bigger. The 38BBRK has a bath-and-a-half with rear kitchen, a walk-out closet up front and full shower at the front of the unit. The interior also has received upgrades, with power seating and residential-style sofas and hide-a-bed sofas all manufactured by Franklin Furniture in Mississippi. The Champagne Edition has the new 38EFK floorplan with a front kitchen. "The big word we hear about our new lineup is 'Wow.' We're hearing that word and that was the whole intent with the changes we made to the product," says Clair. Sandpiper/Sierra Sandpiper and Sierra will show three new floorplans at Open House this year. 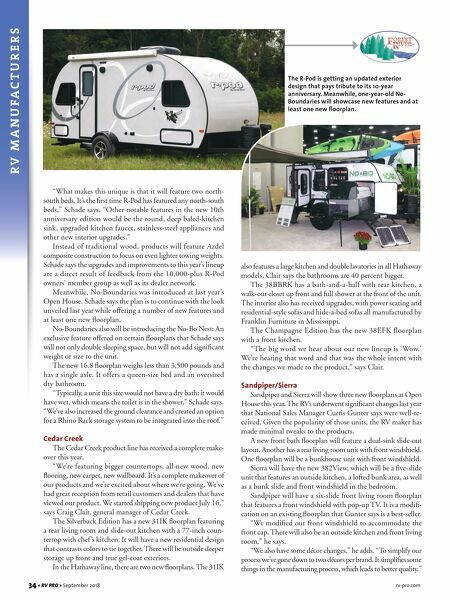 The RVs underwent significant changes last year that National Sales Manager Curtis Gunter says were well-re- ceived. 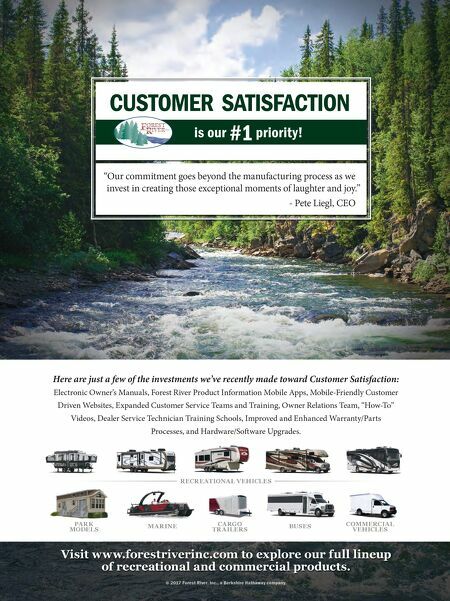 Given the popularity of those units, the RV maker has made minimal tweaks to the products. A new front bath floorplan will feature a dual-sink slide-out layout. Another has a rear living room unit with front windshield. One floorplan will be a bunkhouse unit with front windshield. Sierra will have the new 382View, which will be a five-slide unit that features an outside kitchen, a lofted bunk area, as well as a bunk slide and front windshield in the bedroom. Sandpiper will have a six-slide front living room floorplan that features a front windshield with pop-up TV. It is a modifi- cation on an existing floorplan that Gunter says is a best-seller. "We modified our front windshield to accommodate the front cap. There will also be an outside kitchen and front living room," he says. "We also have some décor changes," he adds. "To simplify our process we've gone down to two décors per brand. It simplifies some things in the manufacturing process, which leads to better quality." The R-Pod is getting an updated exterior design that pays tribute to its 10-year anniversary. Meanwhile, one-year-old No- Boundaries will showcase new features and at least one new floorplan.